Create hollywood-inspired curls and waves with the Glamoriser Glamour Rollers, a set of 24 heated rollers that add luscious bounce and volume to your hair. Housed in a compact case, the silicone rollers heat up in just five minutes and don't require clips or pins to hold in place. Simply pull the silicon tab over your hair to secure the roller in place for faster, easier, classic curls. 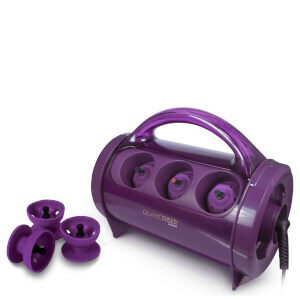 Suitable for all hair types and lengths, the rollers come in varying sizes, and will add body and bounce to your style. Create glamorous, retro-style curls in no time. Equipped with a heat-ready indicator and compact case for easy travelling and storage. Simply pull the silicon tab over your hair to secure the roller in place for faster, easier, classic curls. Leave rollers in hair for as long as possible for maximum curl impact.